Check out the state-of-the-art service department available at our dealership! We know that you’re going to want to keep up with the best of them on the streets, that’s why we offer service and parts specials! Keep your pre-owned automobile running like a champion with the help of our service technicians. It’s easy to schedule service, our prices are affordable, and we’re conveniently located near Bountiful, Utah – what more do you need? Schedule service online with our secure website and enjoy your day. You can take care of business without leaving the house, thanks to us! Our team makes it easy for customers to make decisions on the go. Fill out our secure form and even order parts online with our team! Why should you use genuine parts? When you use genuine automotive parts, you’re ensuring the longevity of your car. Many people argue that it is cheaper not to choose genuine parts. But compatibility is something that is guaranteed with genuine automotive parts. You don’t want to have to replace a part twice because it’s not compatible with your vehicle – that’ll end up costing more money over time. Our automotive technicians are certified. We know how to do it all here at our dealership in Utah. Scheduling service is easy. Whether you need a wheel alignment or a battery replaced, we’ll be here for you. 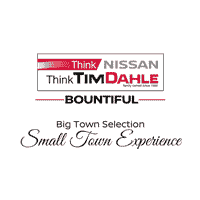 You can count on the experts at Tim Dahle Nissan Bountiful to help you keep your vehicle on the road. Contact us now to learn more about our tire, brake, and battery services. We can help you keep your car running at its optimal level with our standard tune-ups and oil changes. Call now to learn more about our prices!